A brief but powerful rainstorm blasted Toronto Wednesday afternoon, toppling trees, smashing vehicles and even flooding the city’s busiest shopping mall. Environment Canada issued a severe thunderstorm warning around 4 p.m. Shortly after, sheets of rain and powerful winds tore through the city. The storm was so powerful that rain poured into the Toronto Eaton Centre. 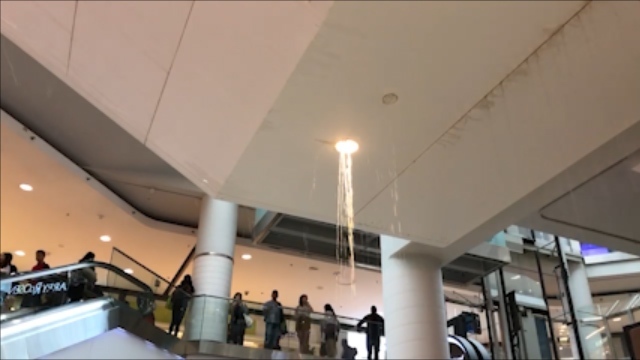 Video from inside the mall shows water pouring from ceiling light fixtures as security guards block off flooded areas. A spokesperson said the leak began on the third floor of the mall and eventually trickled down to lower levels. Areas of the mall were closed off to deal with the swampy situation. “It’s like a pool,” one mall visitor told CTV Toronto. A fallen hydro pole snapped in two and crashed on a white Mercedes car at Edmund Ave. and Avenue Rd., trapping two people inside. The occupants called 911, and officers helped the two individuals leave the vehicle without being harmed by electric wires. Initially approximately 16,500 customers scattered across the city lost power, Toronto Hydro confirmed in a tweet early Wednesday evening. A few hours later, the company tweeted that the number dropped to 9,000 customers without power. Toronto Police said traffic signals may be impacted by the storm and advised drivers to treat those intersections as four-way stops. Officials expect it will take hours to fix the outage. On social media, Torontonians shared imaged of cars crushed by downed trees, traffic lights torn from poles and power lines toppled. GO Train service on the Barrie line was briefly stalled after a broken branch fell on the tracks. While the storm was strong, it was also brief. Clear, sunny skies returned moments after the storm passed with a mid-day temperature of 24C. By 5:30 p.m., severe thunderstorm watches and warnings were still in place for much of southeastern Ontario, including Ottawa, Kingston, Belleville and Brockville. 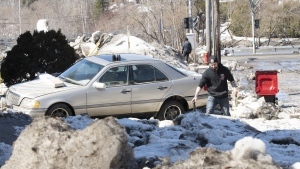 Nickel-sized hail and winds blowing at upwards of 100 kilometres per hour were expected in some areas. Water pours from the ceiling of the Toronto Eaton Centre as a rain storm hammers the city on Wednesday, June 13, 2018.